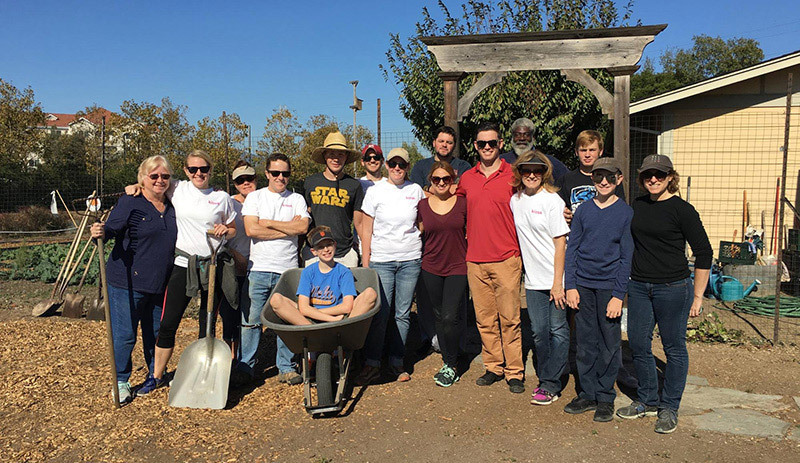 On Saturday morning, a group of Kiosk staffers rolled up their sleeves to help out at the gardens of Homeward Bound of Marin, one of the charities we’re supporting this year. This was the agency team’s second visit to the garden, and under the careful eyes of Homeward Bound staff and residents, we were able to harvest some of the veggies we’d planted in March, help out with some weeding, haul wheelbarrows full of bark and generally work on our green thumbs. Homeward Bound of Marin offers transitional housing and job training to homeless families and adults in Marin. The garden provides food for residents, job training opportunities and a chance for people in the community to get acquainted with Homeward Bound of Marin and their programs. Kiosk recently provided a web makeover for The Key Room, Homeward Bound’s restaurant and convention space, which is central to the charity’s employment training program. All would agree it was a rewarding experience to be able to complement our digital support of Homeward Bound with some hands-on, organic graft, where we got to learn about good gardening practice from experienced hands on the Homeward Bound team. It’s a fantastic charity, and a partnership we’re proud to be part of. Please help us reach our fundraising goal! To donate to Homeward Bound of Marin, please click here to make a donation large or small. Thank you!